Congrats to Roger from Boston! He is the winner of the million view giveaway. 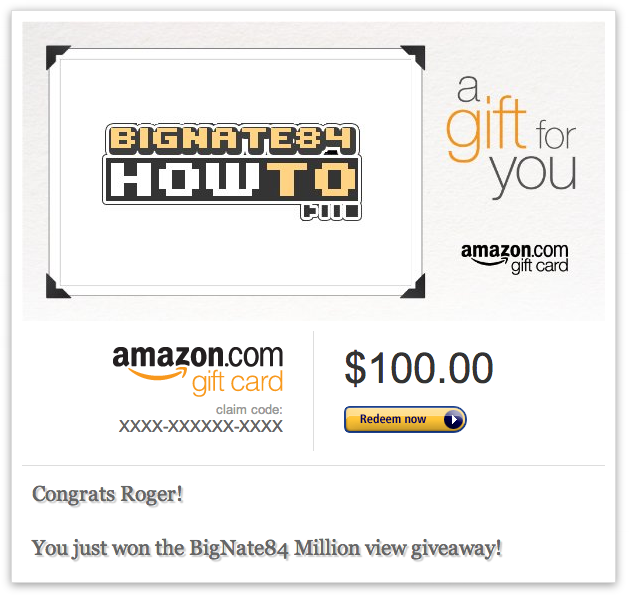 On August 21, 2013 I used a sequence generator, courtesy of Random.org, to select one of my email subscribers as the lucky winner. The contest launched back in July as a way to celebrate reaching a million views and give back to you guys! I wouldn't be creating YouTube videos or a website like this without your support. So thanks to everyone who participated in the contest. 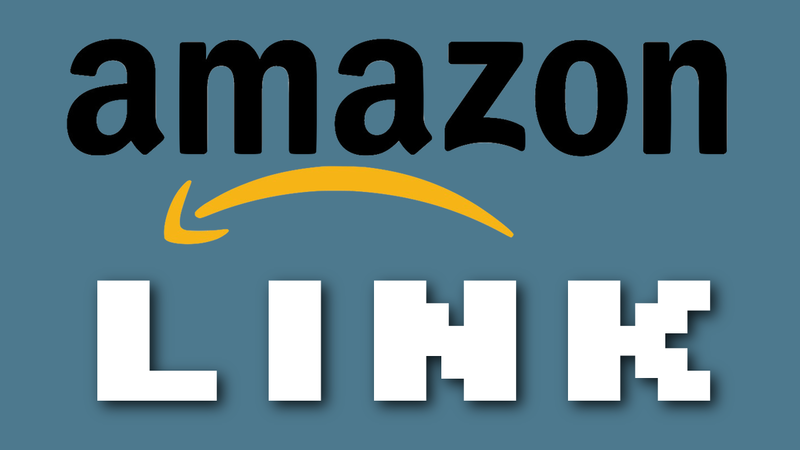 I plan on doing more giveaways as I earn more revenue. I think it makes things a little more fun and exciting. 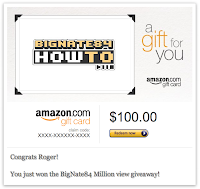 Enjoy the $100 Amazon gift card Roger! Make sure to let us know what you bought with it! This week I have been researching social media and internet marketing through various podcasts, and there is a ton of awesome content out there. One of my Redband colleagues, Jason Griffing, introduced me to Pat Flynn on Twitter. I have been absolutely loving Pat's Smart Passive Income podcast! I think his stuff resonates with me because it gives both credibility and affirmation to what I have been working towards. If you know me, you know my goal is to create high quality content that actually helps people. It's nice to know there are others out there who share that same goal, and who happen to be wildly successful! Hope this opportunity to win a free $100 gift card has inspired you to join me in making the internet a better place. It's one thing to use Google Hangouts the same way people use Skype for a private video chat with friends. It's another thing when you decide to experiment with the "On Air" feature to make your video stream public on YouTube and beyond. I've learned through experience there are some important things you should consider. A few hours of planning prior to your live event will go a long way. Hangouts On Air is a free feature offered to Google+ users that allows you to use the internet to broadcast with nothing more than a webcam and web browser. It could be a church service, town meeting, little league game, live performance or even a wedding. If you want to have a good laugh you can watch my first attempts at participating in a couple live video streams here. Here are 8 live streaming tips for Google Hangouts On Air. Hangouts On Air will be abbreviated as HOA. There's a reason why stock cars don't have head lights or air conditioning. They're built for speed. When you're doing a HOA you need to use the best computer you have access to with the fastest CPU (Central Processing Unit) otherwise know as a processor. That computer needs to be dedicated to the HOA only. No web surfing or other programs going on in the background so that you can conserve your computers horsepower. Encoding live video into ones and zeros and sending time sensitive packets of data all over the world for real time communication requires power. Make sure you're doing all you can to keep your computer dedicated to the live stream. If you have access to two computers dedicate one to the HOA and another to monitoring the live feed and moderating comments. You're already at the mercy of your internet service upload speed and Google's encoding & decoding methods. Don't sacrifice quality by stealing CPU power to play Snood or Words with Friends in the background. Video Quality Tip: Currently HD video isn't available for HOA. Most likely you will achieve 240p or 360p. However, with YouTube Live you can get 720p or higher live streams with the right hardware and software. An Intel Core i7 Processor, 10 Mbps upload speed and free live production software called Wirecast for YouTube should get you streaming in HD. You must be a YouTube partner and you must apply for permission to gain access to the YouTube Live feature. Test everything before the event, then test it a second time. Keep in mind Murphy's Law will be hard at work. If something could go wrong, it will. In the world of theater and live events they have these things called dress rehearsals. It's remarkable the number of issues that can be caught and prevented by doing a walk through the day before. Once you get your HOA team on the same page and comfortable with the technology things will go more smoothly. I just did a HOA with the Redband crew and our dry run was very helpful. That said, Murphy and his law manifested itself in various ways that no one could have predicted. One example was that my lower thirds were not functioning after we went live. They worked perfectly during the dry run but when it came time to go live all I could get were some silly mustache overlays but no lower thirds! Oh well, you get what you pay for, we still had a blast doing the live show. Speaking of Murphy's Law - I believe George Tucker (one of my Redband blogger buddies) actually experienced a blue screen of death minutes before Redband Radio episode 2 went live! Redband Blogger Buddies will be abbreviated as RBB. Lower Thirds: Lower thirds are the text and or graphics that appear near the bottom of the screen. If you've watched the news you've seen lower thirds. As the person running the show it's important to know where the HOA lives so you can promote it properly. Whether you realize it or not YouTube has its own thriving ecosystem. You may have a number of viewers commenting on the YouTube watch page while you are focused only on Google+ or your website. You can either designate a moderator to keep an eye on all the incoming comments from Google+, YouTube, and a custom webpage or you can direct users to a central location for live interaction. Personally, I like the idea of using a specific twitter hashtag that corresponds to your live event. You can designate someone to keep an eye on the hashtag using TweetDeck and bounce back and fourth from the topic of the show to live audience interaction every 5 minutes or so. Start A Routine: Make sure your audience knows how you plan to respond to them. Reading comments and questions in the order they arrive is a good way to go. Or you could have a moderator cherry pick only the best questions. Or you could just read the most recent comments. More people will participate if they know what to expect. Mention viewers and their comments on the air! Interaction is key! If you've ever called into a radio program and had the chance to hear your voice on the air it's a very cool feeling. Maybe it's just me but there's some sort of magical thrill about hearing your name and remarks live on the air. Doing this will not only foster loyalty among regular listeners but once your show becomes a scheduled occurrence and your audience begins to grow to thousands of viewers from around the world you will have a unique interactive experience that traditional broadcast mediums simply do not have - yet - for the most part. Traditional broadcast is starting to become more social media friendly. The best part about all of this is that you don't need $500k of video equipment to broadcast live. If you're a true social media pioneer, you can start a podcast from your basement and be pretty successful without taking on any risk. Plus it's fun. This is one of the toughest things to do. If you want to be successful and gain consistent viewership you need to commit to a time and place each week or each month. It needs to be abundantly clear that every night at 9pm the live stream will be there. Or the first Tuesday of every month at 7pm the live stream will be there. It's ok to change your style, change your format and test new things but I think the schedule is something that needs to be established. In the past I have been a very loyal viewer of the Daily Blob with Eli The Computer Guy and The PCM Tech Help Show with Craig Chamberlin. I'm sure these guys will agree driving people to your web site is important for earning revenue and building your brand. This is why I think that creating a custom webpage with the embedded live stream video is the best way to go. People can bookmark that webpage and even if you change live stream platforms the central viewing location will remain the same. I currently don't have my own live show but whenever I participate as a guest in a live stream I will get the code and embed the video under the Live Stream section of my website. This is especially important if you're not scheduling consistent live events. People need to know when and where to watch live. The details should be tweeted at least a week in advance. If you have a team of people, like Redband for example, who are active social media community members you may have more social media leverage than you realize. Strategic implementation can act as a collective megaphone to reach an exponential number people and get the word out. The thing you want to avoid is looking like spam. There needs to be a balance between carpet bombing Twitter, Facebook and Google+ five minutes before you go live and promoting your live event skillfully and thoughtfully throughout the week. The big idea here would be to have each team member tweet or post about the event in an authentic way in the week leading up to the event. Targeting a handful of hashtags that are related to your topic or industry will also be key. I have more to say on this but I don't want to give away my secret sauce before I've tested it myself. If you are creating useful content that helps people it probably won't be mistaken for spam. Starting and ending a HOA can be a little strange. Especially the first time you do one with remote participants calling in from all over the country. They probably haven't done live radio, they might be a little nervous speaking into a camera, and they are probably a little uncomfortable with the HOA technology. Once you click the button to go live there is no turning back. Consider playing a pre-made count down video via screen share. This could be a two minute video that shows a clock ticking down. You can also include branding material and all the information viewers need to watch and interact with you. The beauty of a two minute countdown is that it gives the host and participants time to collect their thoughts, get the embed code or URL from the YouTube watch page and share them on social media. The embed code and URL are the life blood of the live stream. This information needs to get out. The challenge is that these two very important pieces of code are not available until you actually start the HOA. Often times the host and participants aren't in the mindset to go digging for this code since they are a little preoccupied with what they are about to say. It's nice to have a standard intro and work flow that allows for time to get a glass of water and time to publish the URL and embed code before the show actually begins. Any AV professional working in commercial integration or broadcast will tell you that good lightening is essential for good video. The auto-adjust technology baked-in to USB cameras now-a-days is pretty darn good, but it can't work miracles. I use the Logitech C920. It will automatically adjust for focus and brightness depending on how close I am to the camera and how bright or dark the room is. You can help your camera make these automatic fine tune adjustments by getting the overall lighting in your room in the right ball park. 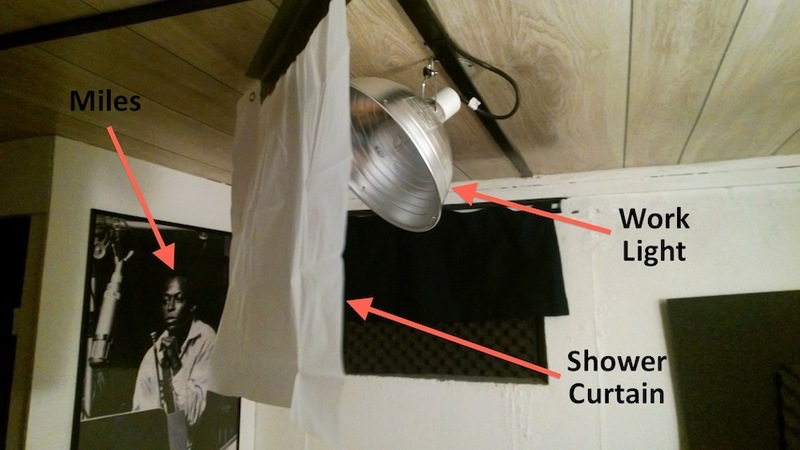 If you can't afford to invest hundreds of dollars in professional lighting, head down to the hardware store and invest $20 in (3) work lights, (1) transparent shower curtain and (3) hundred watt Edison style light bulbs (no curly-cue deals). This is a bit of a hack and it will look like garbage from your perspective sitting in your basement but it will greatly improve your video quality and your viewers will never know how cheap you are. It may take some time to get your lighting setup correctly, but it can be done for cheap. Lighting Tip: The room should look unnaturally bright to you, but on camera you will see a much better quality video. If you're wondering why I didn't mention how to get great sounding audio, it's because I am a bit of an audio geek. Don't believe me? Just check out some of my Live Sound 101 videos. Once I start talking about audio it will end up being an entire blog post by itself and this one is already way too long. Thank you so much for stopping by my website. I'd love to hear your feedback. Please let me know if you found this helpful or if you have any more tips to add to the list. Over the past few months I have found myself meeting with curious friends and colleagues to talk about using social media effectively. I get the sense that many people just don't know where to start. Here are some tips about setting goals and networking on Twitter taken from a conversation I had with my friend Joe. Last weekend my good friend Joe came by for a collaboration video. Collaborating with other motivated people is a great way to grow your audience and gain more exposure. Joe and I ended up filming some fun and informative video footage to be uploaded in the near future. We also had an impromptu social media brainstorming session. 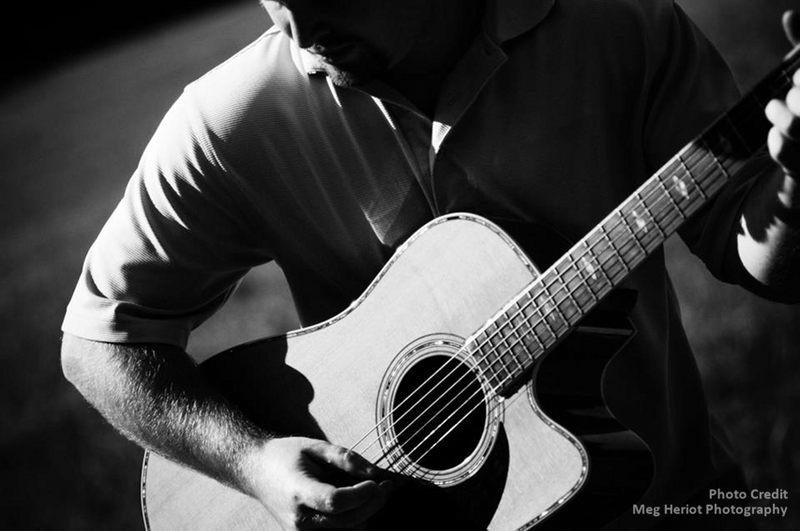 Joe is the front man of the Boston based band Joe Greaney & The Chasers. He is passionate about music and being an artist, but social media and all this new technology can distract from making music, recording and rehearsing. However Joe understands that he needs to be able to effectively use Twitter, YouTube, Facebook, SoundCloud, Gig Salad, Gig Masters and Google+ in order to get his name out, get gigs and ultimately be a successful musician. It sounds like a lot, in fact I'm a little overwhelmed just listing all those websites, but these are just a few of the many powerful networking tools that can be used to reach your goals. I started asking Joe about his goals as a musician and writing them down. Winning a Boston Music Award would be a pretty lofty accomplishment. I think we can work with that. Once that goal was written down a flood of questions entered my mind. Who won an award last year? Who were the nominees? What venues did they play? Did they have an agent? Where do they record? Who gets to vote? What's the competition like in your genre? What can you do now to position yourself for a chance to win an award in 2015? Ultimately that one big goal gave birth to a series of baby steps that will get Joe moving in the right direction. This is a very specific example for a musician in Boston. My hope is that you can learn from this real life example and apply it to your networking strategy in whatever industry you wish to pursue. Will Joe Greaney and the Chasers win a Boston Music Award in 2015? We shall see. No matter what, having this goal will get Joe moving in the right direction. There are a million places to start. It's best to focus on one thing at a time when you're brand new to social media. I recommend Twitter. Each of the big social media sites has it's own online ecosystem. In some cases that means 100's of millions of users interacting every day. Do a little homework about your industry and find out where people tend to congregate online. Pick one site and spend a few months really digging in and mastering it. In this case my advice to Joe was to focus on Twitter. You might be wondering, "How do I master Twitter?" Glad you asked. I'll assume you know how to navigate to Twitter.com and create an account. Once your account is all set up you need to master the hashtag, otherwise known as the pound "#" symbol. Placing this symbol in front of any word in your tweet makes it a tag that other people can search for and sort through on Twitter. Navigate to the search bar at the top of twitters website. Search for topics related to your industry. In this case #BostonMusic, #BostonBands, #BostonArtist. Now you will be able to see the most recent tweets and people who tweet about that topic. You should dig in more to discover other related hashtags that are already popular. Many twitter users put hashtags in their profiles to show what they're all about, you should add some to your profile too. And make sure to use these hashtags frequently so others will start getting familiar with you as part of their online community. "Hey, aren't you that guy who plays live at John Harvards Brewery every month? #BostonMusic #NoCoverCharge"
Hashtag Tip: You can tell if a hashtag is popular when you search for it. Check out the date of the latest tweet in the search results. If it's seconds or minutes old it's probably a good tag to start using. If it's a few months old you may want find a different one. @BigNate84HowTo I'm actually reading your blog, you rock! Publicly mentioning other people by name and giving credit is key. An easy way to do this is to retweet something. There is a button dedicated to the function of retweeting to save you the hassle of copying and pasting. Retweeting also gives the author of the tweet credit. The abbreviation for retweet is "RT" in case you see an "RT" in someone's tweet. If I'm Joe I'd be retweeting local venues, local bands, local brands, local music magazines and anything relevant to fans and musicians in Boston. Make public lists of all the up and coming bands in your genre. That way fans and other musicians can subscribe to your list and it can help other people discover new talent in the area. This is a great way to help out younger less established bands. Who knows? Maybe someday they will help you out by getting you an important gig. Private lists are also a great way to stay organized and sort your contacts in a way that makes sense to you. There's is much more that could be said on this topic, but this is enough information to get a social media rookie headed in the right direction. Feel free to leave a comment or find me on Twitter @BigNate84HowTo and my buddy Joe @JoeGreaneyMusic and the amazing photographer who took this photo of Joe @MegHeriot. Thanks for subscribing!